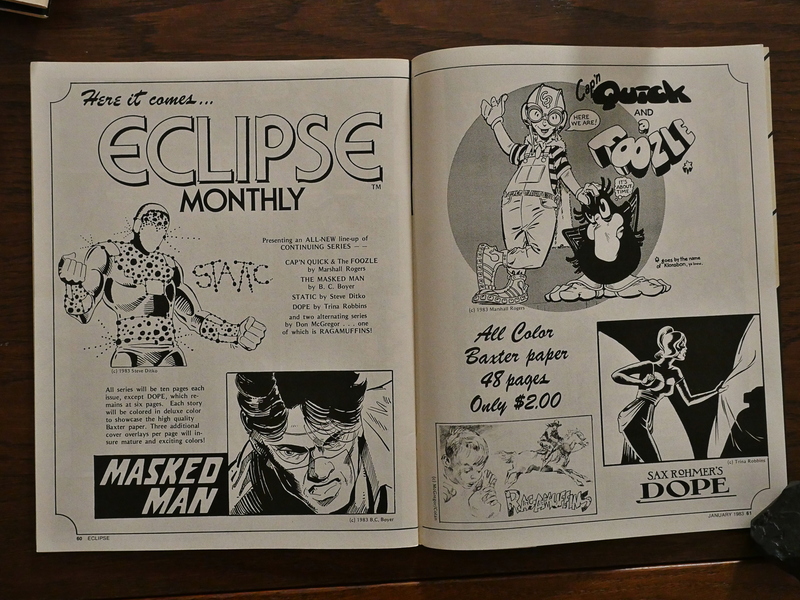 This is Eclipse Comics’ first periodical: The Eclipse magazine (although it’s just called “Eclipse”). 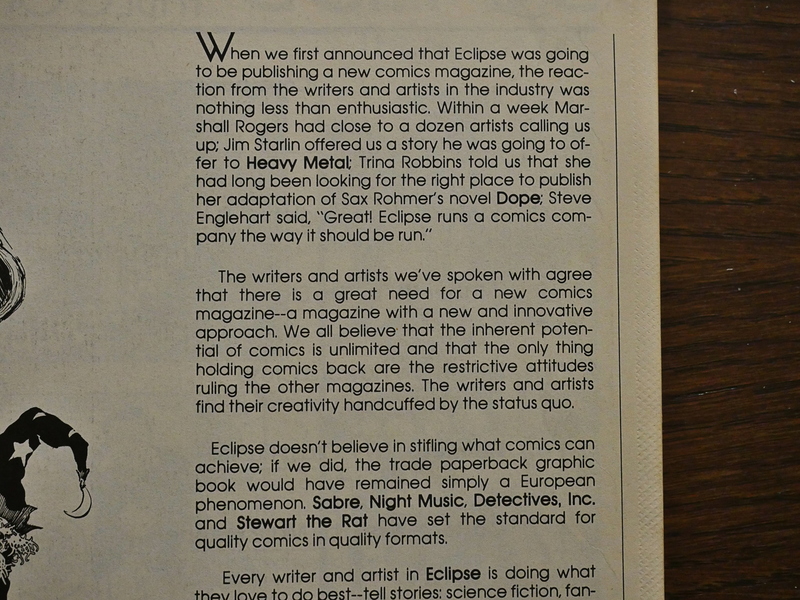 The editor (and co-owner of Eclipse Enterprises) Dean Mullaney explains what the anthology is going to be about without saying “it’s like Heavy Metal and Epic Illustrated, but in black and white and on cheaper paper”. 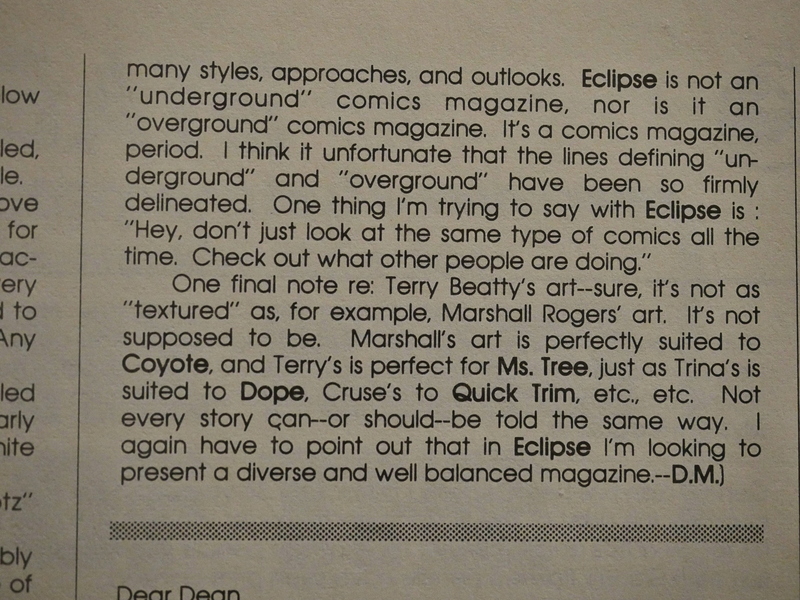 Marshall Rogers was apparently central in herding artists to the magazine. Anyway! 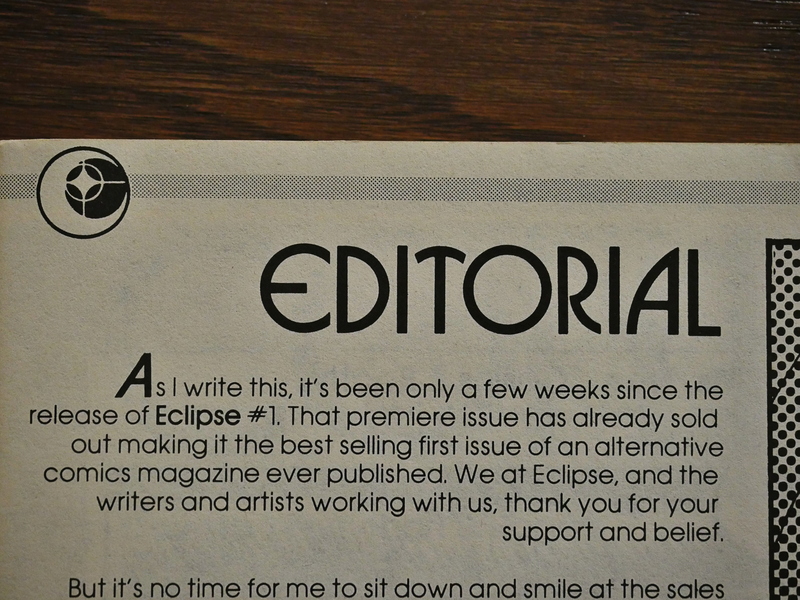 The magazine: We basically get everybody who’s already been involved with Eclipse so far, so it’s dominated by ex-Marvel creators. Here we have an early Foozle story presented as “the first half of a 19 page story”… but then we get all 19 pages in this issue. Perhaps production was a bit hurried? I dunno. 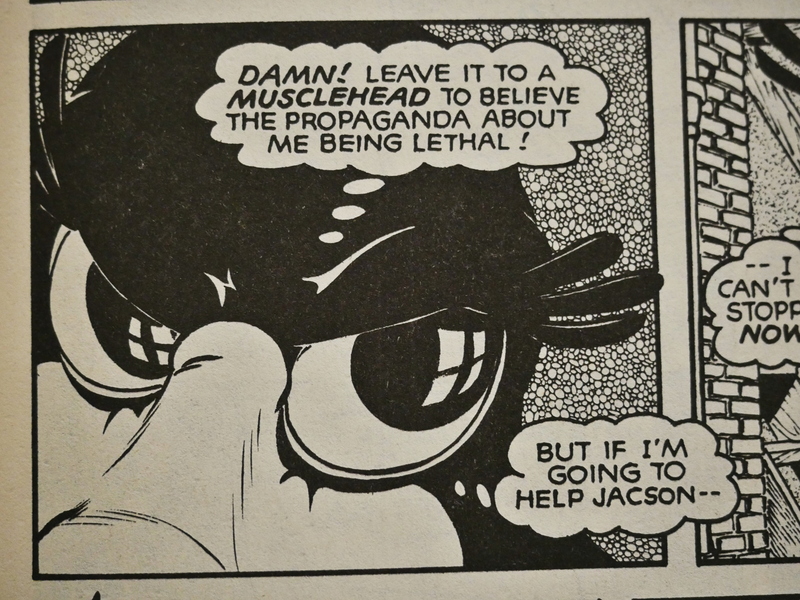 It’s an entertaining piece of sf action humour fluff, but lines like that makes me wonder whether there’s been any previous Foozle strips. A quick google gives me nothing. 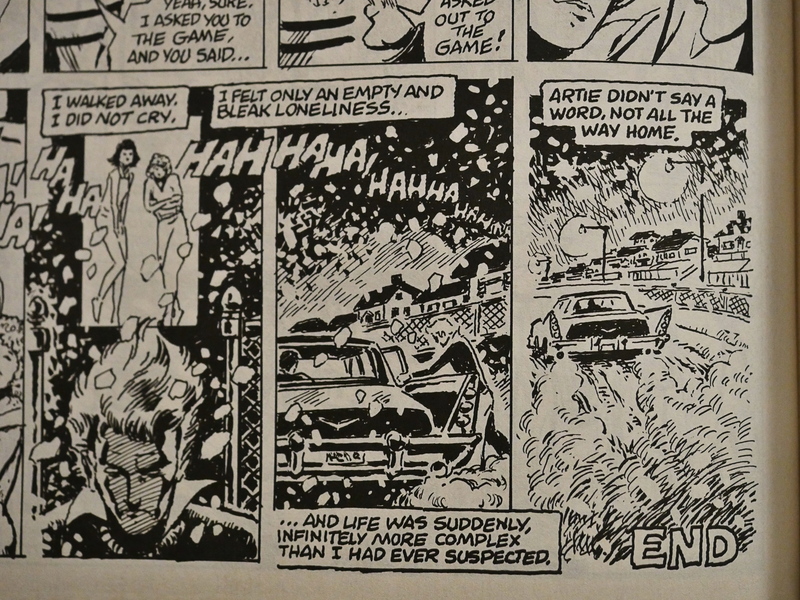 But apart from the wall-to-wall ex-Marvelites, we also get a wonderful short strip by Howard Cruse! How incongruous! After reading that panel, I had to check. 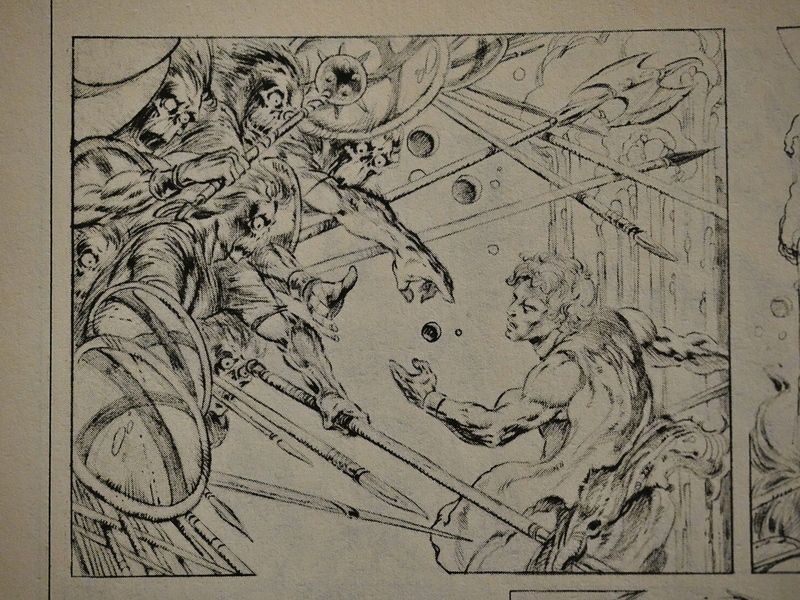 *phew* Still OK.
P. Craig Russell makes a reproduced-from-pencils appearance… which isn’t reproduced very well. We also have the first Ms. Tree story by Max Allan Collins and Terry Beatty. I was expecting this to be really boring and corny (after reading that Mike Mist thing), and it turns out to be mostly just corny. It’s a competently told mystery. And the artwork is … there. See? It’s there. All seven of its features display, in some measure, the unconscious lapses of taste so common to this form. But each fails in a slightly different way, so the tedium that is usual in this kind of a production is somewhat mitigated. At least it is not the same error over and over. I guess it’s a success! See? 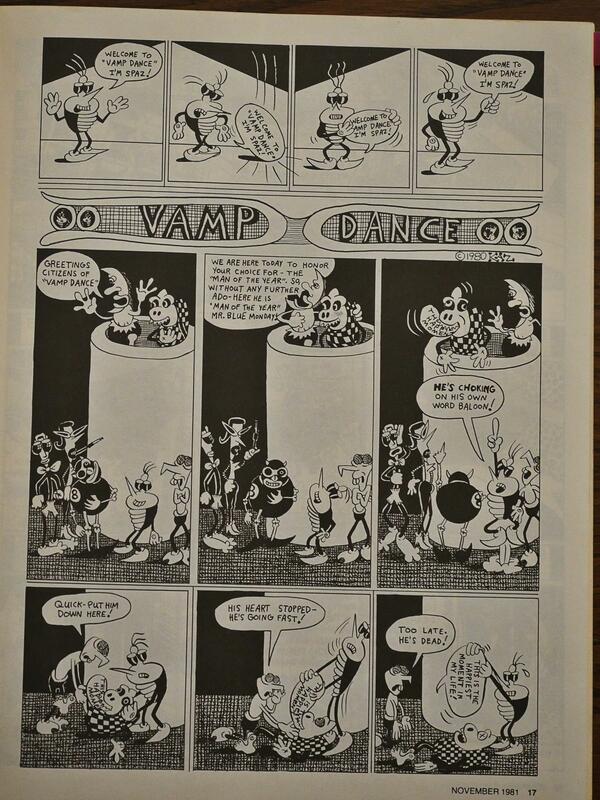 The best selling first issue of an alternative comics magazine ever published. 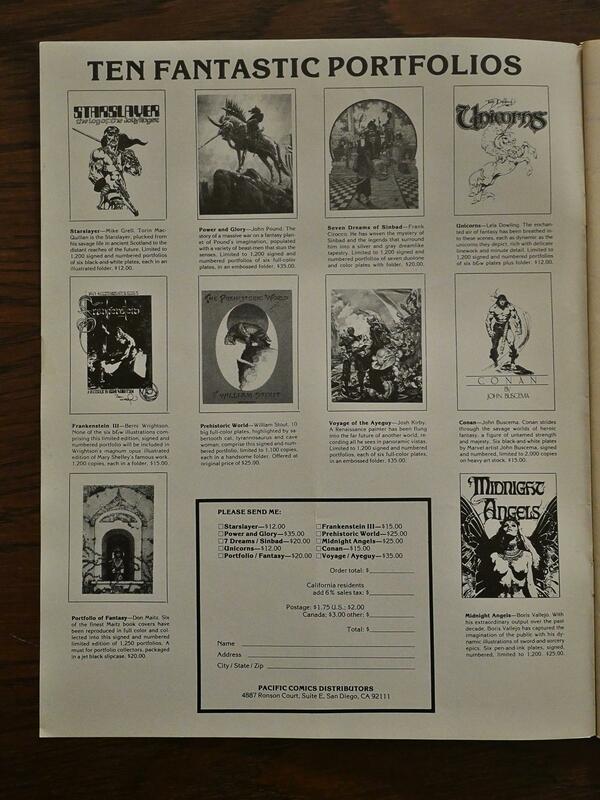 Of course, all other comics magazines have probably not been true alternative comics magazines (or Scotsmen). 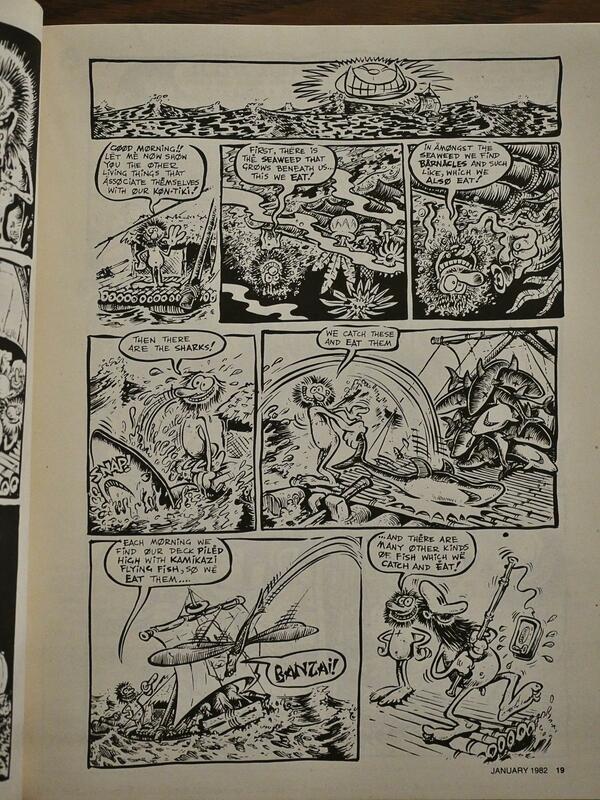 Steve Leialoha pops in with a exceedingly well-drawn fun little thing. The artistic approaches throughout Eclipse’s run varies quite a lot. 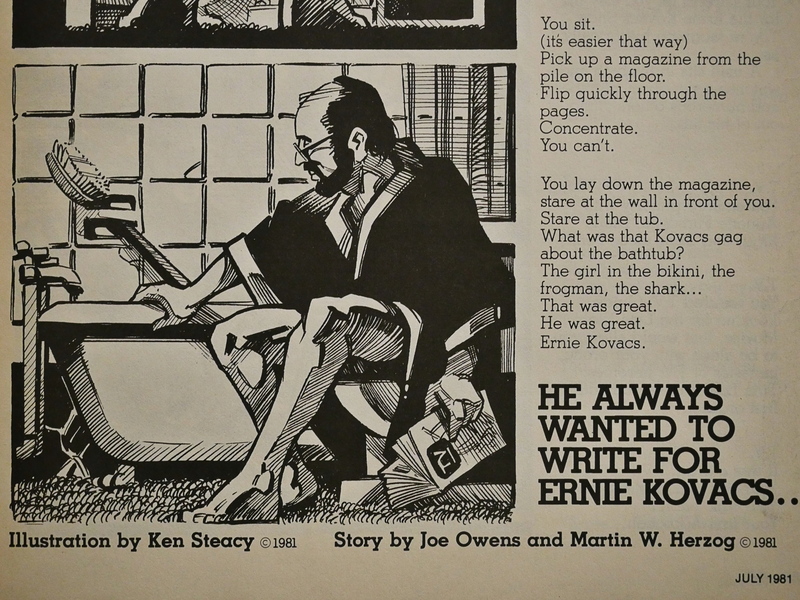 For instance Ken Steacy illustrates a text (about dying and stuff), but somehow the magazine feels quite cohesive. Perhaps because it’s anchored by some continuing strips (Coyote, Ms. Tree and Dope), but also because all the pieces are strongly narrative and vary in tone only between the elegiac and the humorous. 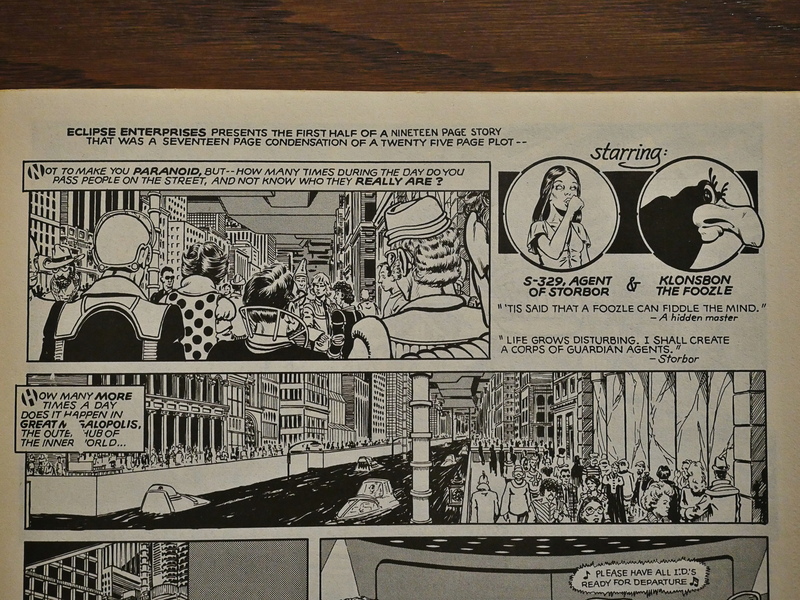 The second issue includes a “poster”, which is the same image as the cover, but printed on non-shiny stock, and which is followed by three blank pages (in the centerfold). That’s a really weird decision. Surely they could have gotten two pages printed for the same amount? 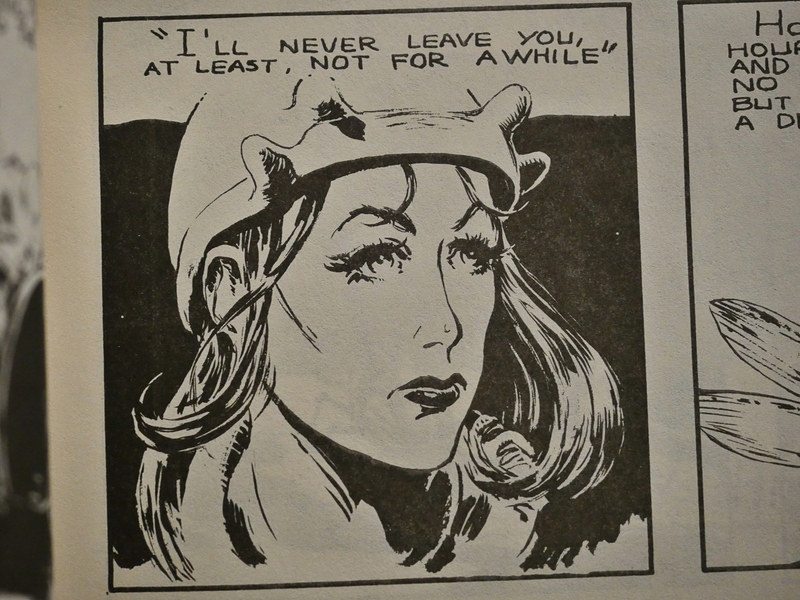 Anyway, Trina Robbins starts her adaptation of Sax Rohmer’s Dope, which continues for the rest of the run of the magazine. 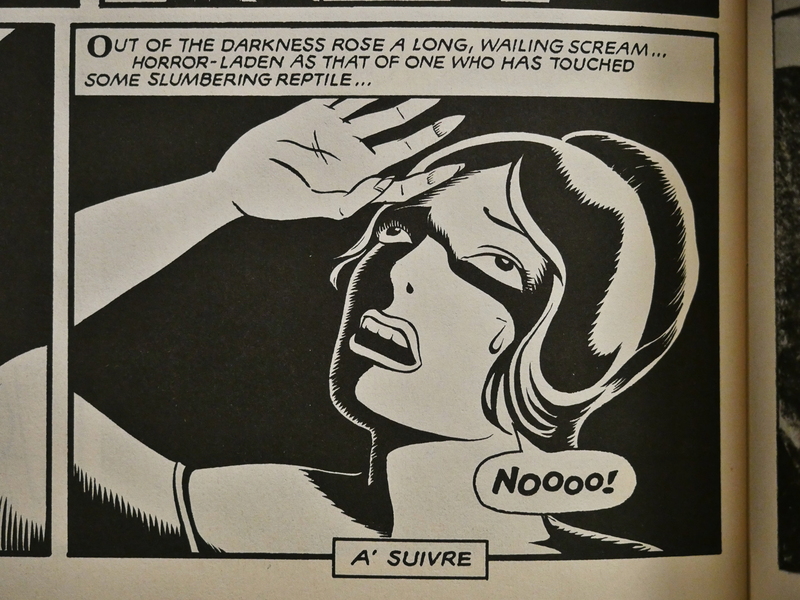 A suivre indeed. 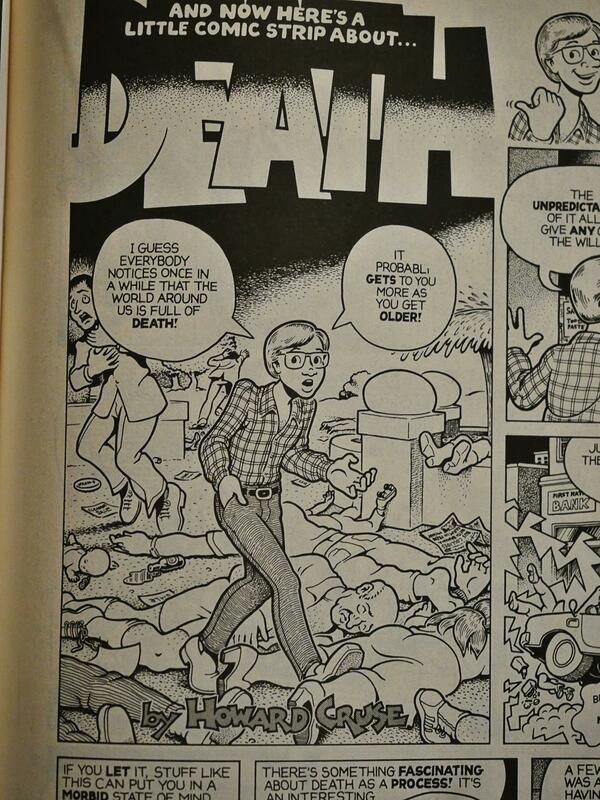 Steve Gerber and Val Mayerik (also Marvel people) contributes a horror story. A letter writer says that it would have been more suited for a Warren magazine, but I’m not so sure. 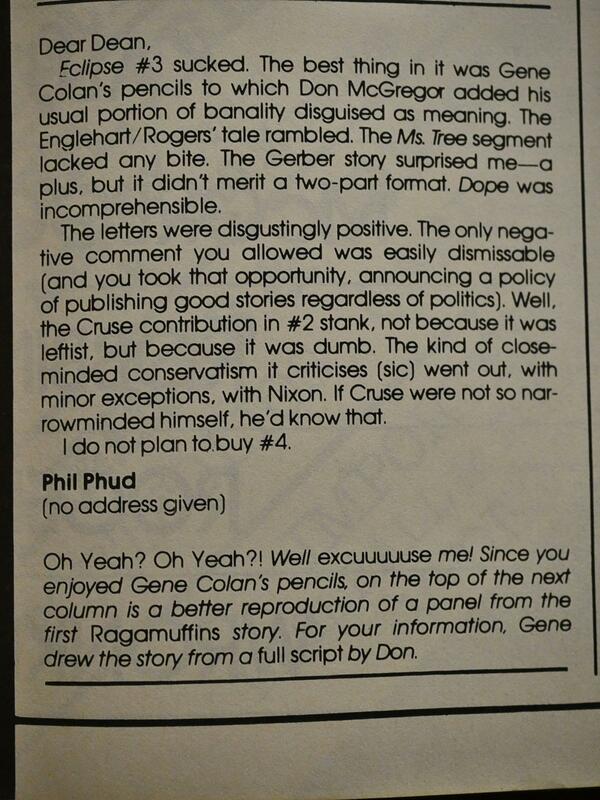 The first half is all about censorship (in TV, this time, instead of comics), which is a Gerber bug-a-boo. The second part is straight-up horrific horror, though, which goes way beyond the call of duty. Rick Geary! 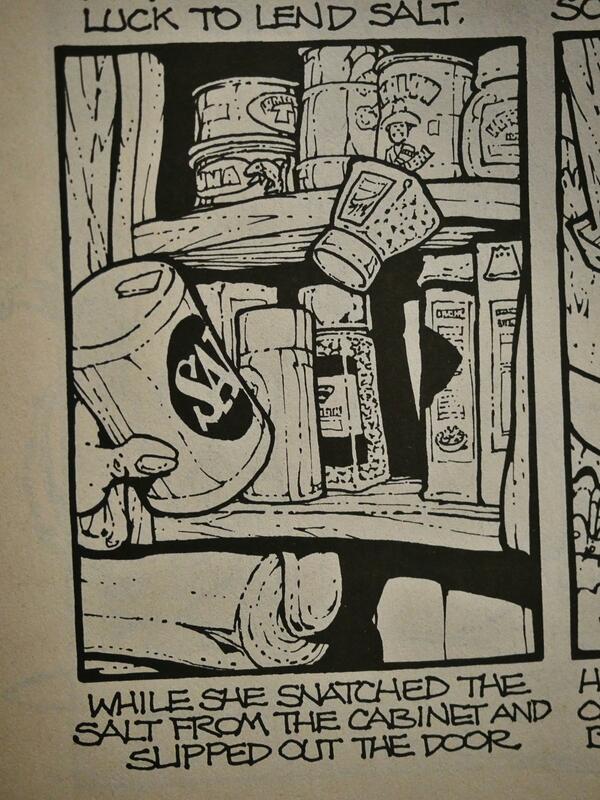 Is there anything as wonderful as seeing a Rick Geary panel of a cupboard? It’s just so … bubbly. 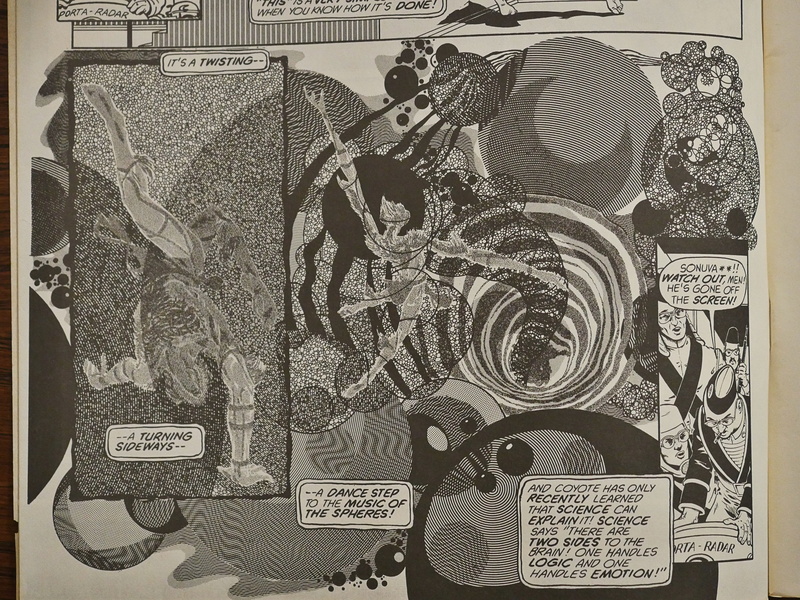 Marshall Rogers buys all the zip-a-tone patterns ever made and pastes them all onto the page. It’s kinda neat. Kaz! What are you doing here! I mean, except being funny. Editor Dean Mullaney displays a quirky and perhaps uncompromising sense of taste. I mean, how many people who showed up for the ex-Marvel gang would appreciate formal punk tomfoolery like this? 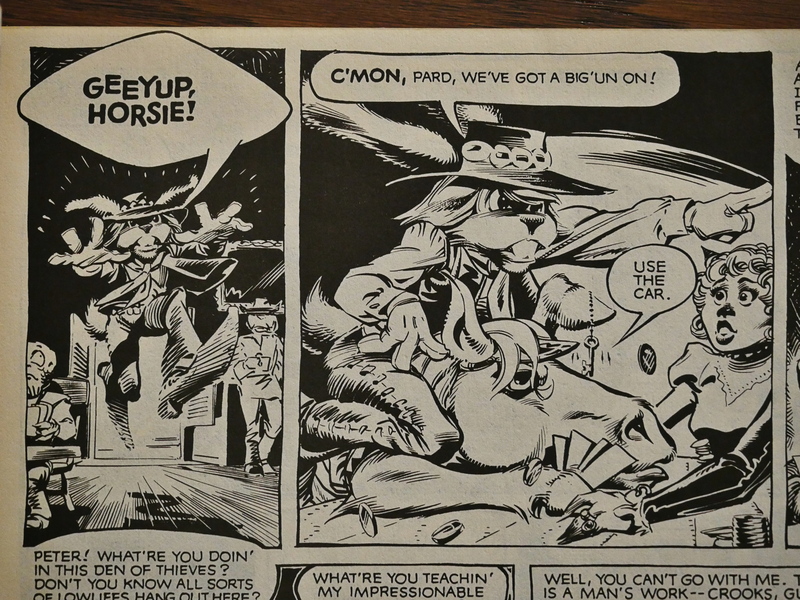 And speaking of ex-Marvel, Don McGregor & Gene Colan’s Ragamuffins string of featurettes starts up, and they’re kinda cute. 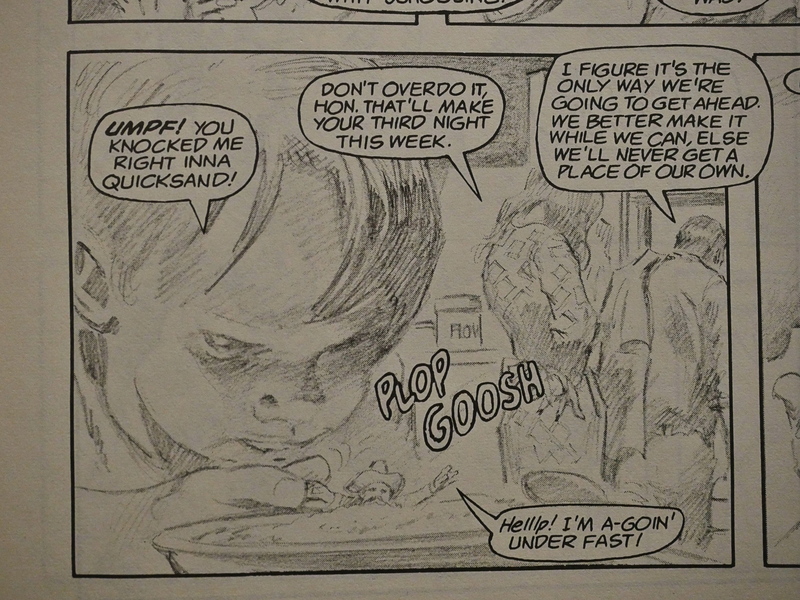 But as they’re shooting Colan’s artwork from his pencils rather inexpertly, it’s less satisfying than it should be. 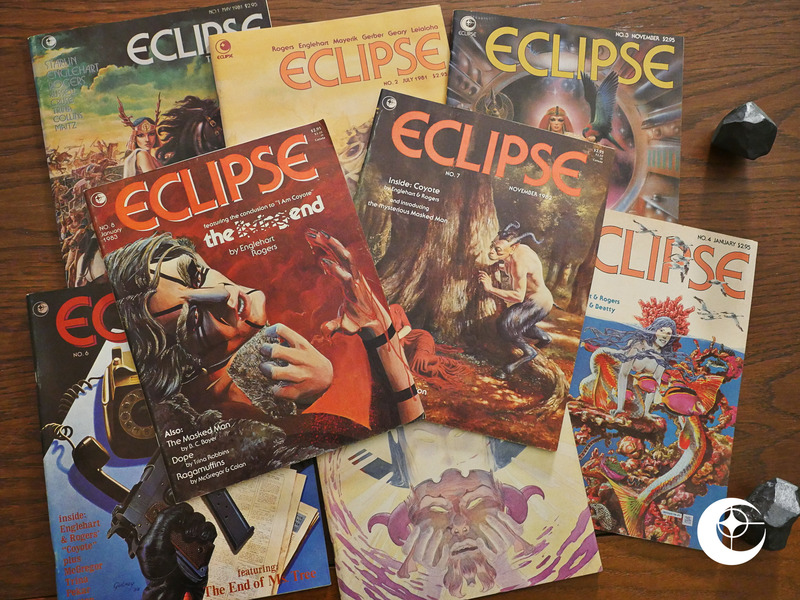 Mullaney explains, again, that Eclipse (the magazine) is a black-and-white version of Epic Illustrated and Heavy Metal, but on cheaper paper. I think. All the contributors to the magazine are American except Hunt Emerson, who shows up for about half the issues with some really funny stuff. I lol-ed out loud a few times. 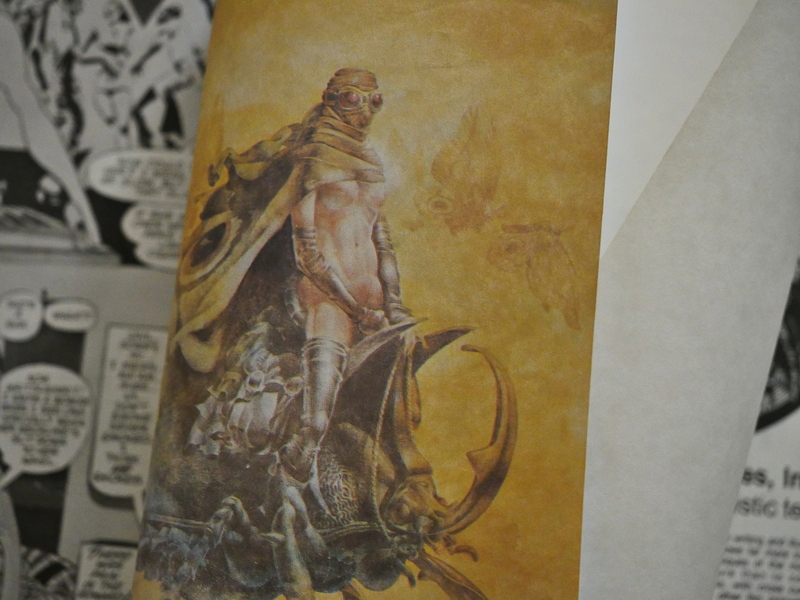 Michael William Kaluta pops in with a single, very untypical piece. 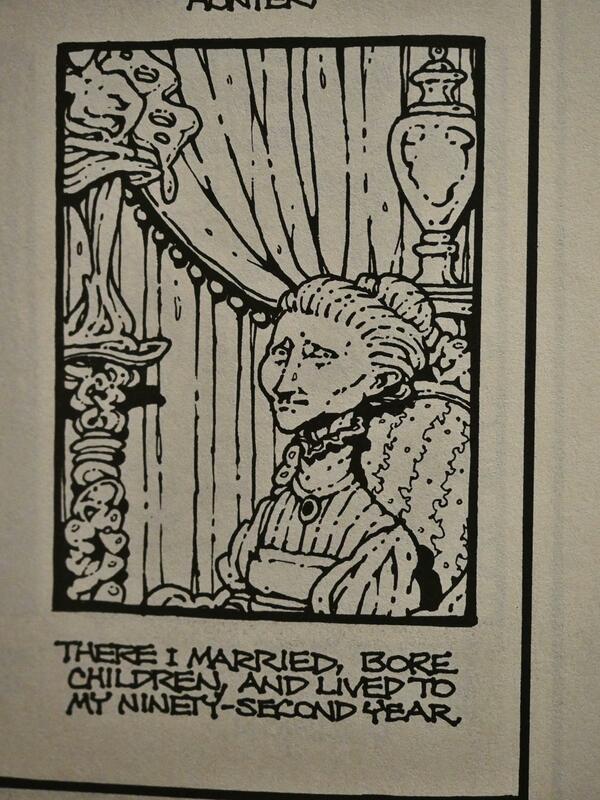 I would not have guessed that that’s a Kaluta drawing. Harsh critique on the letters page. Whaaa? Peter Kuper? 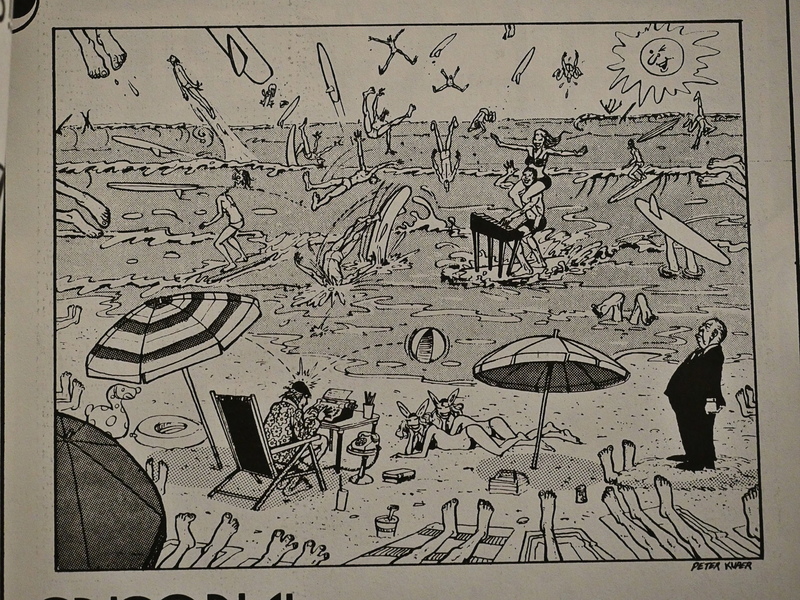 That’s a Peter Kuper drawing? It looks nothing like it. Perhaps it’s a different Peter Kuper? 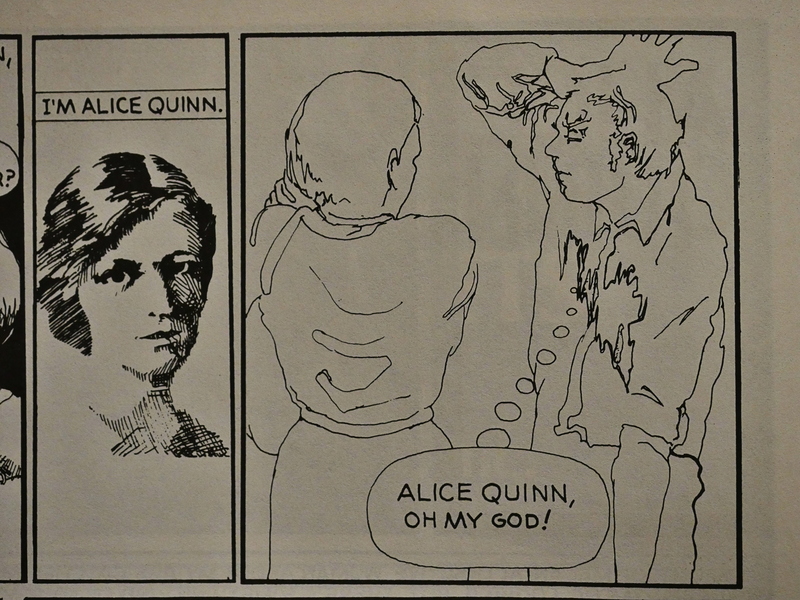 Sue Cavey illustrates a Harvey Pekar story, and I think she does an incredible job. It’s perfectly suited to Pekar’s wistful and nostalgic story. 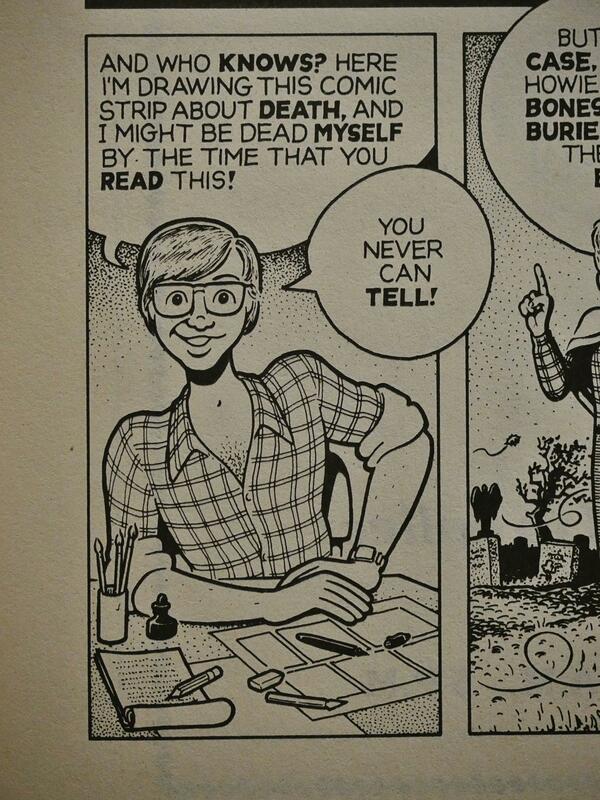 I love Pekar’s work, and this is a very strong piece. Not everything in the anthology is as notable… or not as notable in a positive sense. 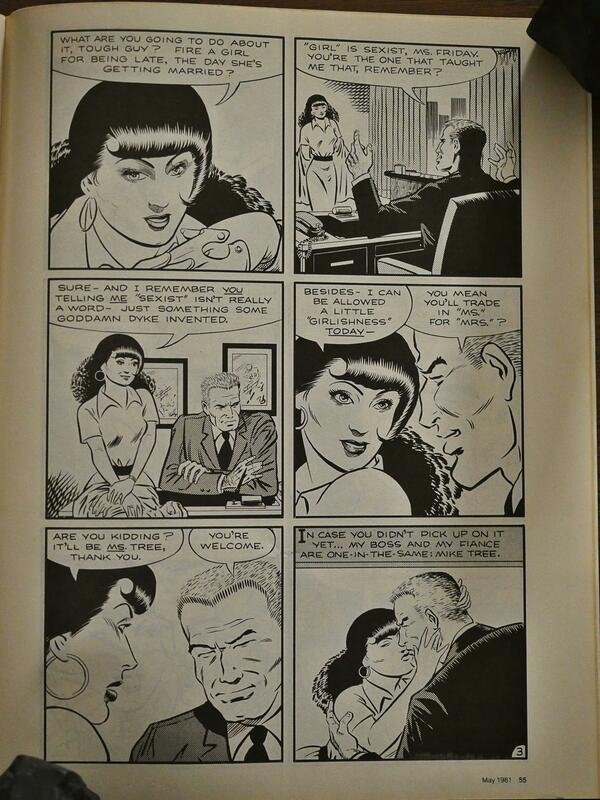 This Tom Sutton/Don McGregor tale of jilted young love is as cringeworthy as you’d expect. And then it’s over! Not because they’re shutting down, exactly, but because they’re transitioning to a smaller, colourful format. And they mention that they’re switching to “Baxter paper” how many times? It was a thing back then. I’ve really enjoyed spending half a day reading this anthology. Each issue is 64 pages, which gives you a satisfying chunk to relate to. There’s enough room to drop the odd 20-page piece into the mix without crowding everything else out, and if there’s a couple of dud pieces (and there are), you’re more willing to overlook that because there’s all these other swell comics in here. Or at least I am. Carter Scholz wasn’t.